If you have a lot of weed in the grass you will probably want to give another application later in the season and a final one in September. 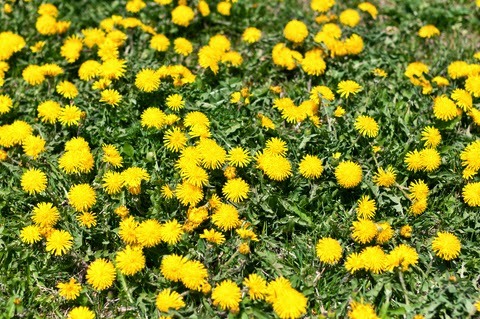 The term ‘weed’ usually applies to invasive plants that are competing with the grass for growing space, mostly clover, dandelions, daisies, buttercups and coarse-leaved grass. You want rid of them but by what means? A yearly lawn maintenance plan will help deal with the problem, starting in spring. If the grass is looking patchy, small flowers appear and patches remain green during a drought, these are indicators you have a weed problem. If you want a non chemical option, feeding, aerating and scarifying the grass combined with digging out rosette type weeds such as dandelion, daisy and plantain with a handfork is a start. Raking and mowing will discourage speedwells, clover and sorrel. You can apply a garden lime to acid soils in winter and don’t mow too closely. This will give you a degree of control but may not be practical over large areas of lawn and where your time is limited. So the chemical route may be the one, applying a weedkiller or mix as suggested above, when the weeds and grass are growing vigorously. For soluble treatments you can spray or use a watering can; or apply granules with a dispenser. New lawns can be damaged by weedkillers but products such as Scotts Verdone Extra claim to be usable two months after sowing. Moss killer can leave black patches and the dead moss should be raked out and grass seed sown in. Always read the instructions on applying proprietary fertiliser and weedkiller, apply treatment in calm weather when moisture is available in the soil but when rain is unlikely for at least 6 hours. Great information! I've recently purchased my own house and the garden is huge, meaning pesky weeds are everywhere. Thanks for sharing!